What about the girls . . . When I wrote my first book, The Secret History of the Pink Carnation, I blithely invented an extra-special torture chamber for my half-mad villain and his collection of the Inquisition’s Greatest Hits. I needn’t have bothered. If there was one thing revolutionary Paris didn’t lack, it was dungeons. In my current work in progress, my hero is employed directly by the Prefecture of Paris, and indirectly by Napoleon’s spymaster, Fouche, so I’ve been making up for lost time by taking full advantage of the dungeons of Paris. Definitely a must-stay for the discriminating aristo or would-be English spy. Located on the right bank of the Seine, in le Marais, the old aristocratic quarter of Paris. Former fortress of the Knights Templar, dating back to the 12th century. A very chi-chi place to be incarcerated: the royal family (Louis XVI, Marie Antoinette, the Dauphin, Princess Marie-Therese, and the King’s sister, Madame Elisabeth) were kept here while awaiting the fatal fall of the guillotine. It was at the Temple Prison that the Dauphin was last seen alive. Other notable inhabitants of the Temple Prison include Sir Sidney Smith, thought to be one of the prototypes of that demmed, elusive Pimpernel (although Sir Sidney was clearly not quite elusive enough, since he spent two years in the Temple prior to his belated daring escape). The Temple might have been the prison for the old royalty, but les Carmes was the place for the new. Watch out—if you stay here, you may run across some of the key figures of the new political order to come. Rose de Beauharnais (later renamed Josephine by her enraptured second husband, a little man by the name of Bonaparte) was imprisoned here during the height of the Terror. Look closely and you may see her small pug dog Fortune running back and forth, carrying hidden messages to her two children, Eugene and Hortense. With her, you’ll find Therese Cabarrus (shortly to be Therese Tallien), who enjoyed a brief fame as Our Lady of Thermidor, hailed as the prime mover behind the fall of Robespierre and the end of the Terror, as well as being best of friends with the future Madame Bonaparte—until an increasingly stuffy Napoleon decided she was too flashy and he didn’t want her hanging around his court. A nice compromise for the discriminating prisoner who wants someplace with a known name, but less flashy than the Temple. Conveniently located in the fashionable district of St. Germain, on the left bank of the Seine, the Abbaye was made notorious in the September Massacres of 1792, when a bloodthirsty mob attacked the prisoners, killing over a hundred with a barbarity that shocked contemporary chroniclers. 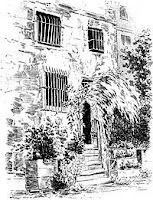 Notable prisoners included Mme Roland, as well as Sir Sidney Smith (yes, he got around). During the Consulate and Empire, the Abbaye was used for the interrogation of prisoners, with methods that included burning the soles of the prisoners’ feet and crushing their fingers in musket locks. Also Available for Bread, Water, and a Little Light Torture: La Force (where indignities were perpetrated upon the Princess de Lamballe); Prison de la Bourbe, aka Prison de Port-Libre (the royal governess and Louis XVI’s lawyer were kept here); the Madelonnettes Prison (the Marquis de Sade stayed here); Saint Pelagie prison (more Marquis de Sade, as well as Mme Roland, although one hopes not at the same time); Le Coignard (um, yeah, the Marquis stayed here, too); Saint Lazarre (originally a leper hospital, but no Marquis de Sade); and many, many more…. Lauren, only you can make prison a laugh-riot! I've studied some of the riots that took place at some of these venerated destinations, but never got the laughs until now. Thanks for some of the distinctions you made among them. I always wondered why some aristo prisoners were taken to certain prisons and not others. In my book on notorious royal marriages, we make the briefest of stops at the Temple (Louis and Marie Antoinette et famille ) and Les Carmes (Josephine). Why did the Marquis de Sade end up in different dungeons for his various incarcerations? No room at the inn? What a fun post Lauren. I had no idea that going to prison could be so fashionable. What if, god forbid, you didn't get into the right prison? What would that do to your social standing? I'm not a fan of ROTFLOL, but sometimes nothing else will do. Great post, Lauren. Great fun. The Marquis de Sade was imprisoned after the Revolution as well, which might account for his peregrinations, but "no room at the inn" just about sums it up during the height of the Terror in 1793/4. Basically, the old system didn't have the facilities for the sheer number of arrests. All sorts of places were being pressed into service as impromptu prisons, most of them dangerously overcrowded. When Josephine was arrested in 1794, the first few prisons to which she was taken were too full, which was how she wound up at Les Carmes-- which was, itself, housing over seven hundred prisoners at the time. And it's not that big a building. After the fall of Robespierre, many of the prisons that had been in use in 1792-4 were essentially emptied out. I'm not quite sure why they moved people around so much. Some of it may have been a convenience factor, moving people from easy holding pens to long term incarceration, or from more populated to less populated prisons. Josephine's husband, Alexandre, started out at the Luxembourg and was later transferred to les Carmes. Some of it may have been an attempt to sort people out by type, but, from the prison lists, it looks like most of them were a pretty mixed bag. Les Carmes had everyone from the Prince de Salm to a boot maker, all living cheek by jowl. Wonderful, wonderful post, Lauren! Hilarious and informative. I can envision a Black Adder-ish skit with a travel agent passing out brochures. My mom and I wrote an escape from the Conciergerie (which was much in use during the White Terror after Waterloo) for "Shores of Desire." Great minds must think alike, Tracy -- I actually had the same "Black Adder-ish" skit thought! Just fabulous! So wrong to laugh at the events, but just so darned ironic! :) Just finished 2 of 3 books on Josephine B., so I love hearing about more of the "guests". Thanks! Tracy, I was just thinking this would be a perfect Black Adder sketch! Lauren, thanks for my laugh of the morning on a very serious subject. Now I am off to my own personal dungeon - my job at Wal-Mart!